For the past 4 years, we are working related to biogas. This has been an intense learning experience. We have made 135 installations of Vaayu so far. Our customers or Vaayu-mitras as we call them are managing upto 1 ton of food waste per day and saving about 1,000 LPG cylinders worth fuel per year. Recently i came across the poem ‘Go all the way’ by Charles Bukowski. The first two lines are. To read the full poem click here. It feels like this poem were written for me, for us. We know we have to wean ourselves from fossil energy. For the last few years we have gradually substituted LPG by biogas at our home and now that we have made a start, its time to go all the way! We have the knowledge to do so and we are backing it with the will to go all the way! 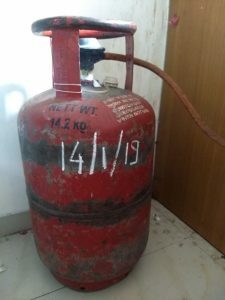 So here’s the Last LPG cylinder that i will be using. Goodbye good old LPG, you have served us well so far. And in this resolve, the members of my society are with me. 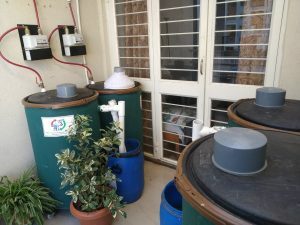 The plan is that all the food waste of 21 families of B wing Kisan Krupa society, will be digested in Vaayu which is set up on my balcony in my 7th floor home. I am thankful that my society members have supported this cause. This will be enough for all the cooking of 5 people. This is how it looks. There are 4 digestors of 2 kg capacity each. So right now we have a capacity to digest 8 kg waste per day. As the winter receeds we will reach that capacity by about mid Feb. Till then my last LPG will be at my service. 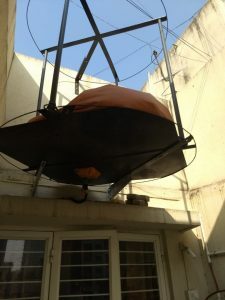 The gas will stored in the 1,000 litre balloon which has been mounted on the wall of the balcony. Food waste is not a problem! It is one step to solve the fossil energy problem. I invite all environment enthusiasts to visit and have a look and some chai or coffee of bioenergy! Lets go fossil free… one step at a time… all the way! You guys are simply awesome !!! An inspiration!!! Very creative and useful innovation. I am really inspired by this successful effort of your team . Will definitely like to see the unit with my family members . This kind of conversion of chemical energy into heat energy is a great help in the direction of saving our natural resources. Awesome, great things is going to be happens. I have to also say good bye to LPG! Let’s do in this year!! hi. very interesting. what abt safety issues? Great going Vaayu team. I am trying this at my end in Florida, US. I will keep updating how it goes! Thanks for all the thought and efforts.